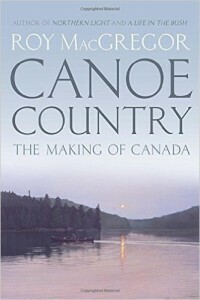 Just in time to take the boats out of the water, Roy MacGregor’s Canoe Country: The Making of Canada, arrived on my doorstep. The glorious fall we have enjoyed on Windy Bay is more lovely than ever. Rain, sweet, heavenly rain, has made our parched woods practically sing with joy. Sitting on our deck with the last rays of summer keeping me warm, I was deliriously happy reading one of my favorite authors. Since there is so much to do this time of year in the garden, I had to ration my reading time, but the book got the better of me, and I took to picking it up at every break. Thanks to Roy MacGregor, my Christmas shopping is going to be a snap. Every canoe lover on my list will unwrap this treasure. 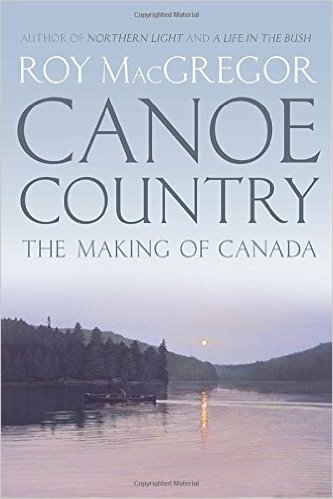 Books written about canoes are few and far between, but we tend to see the same ones in homes of our friends. The book, infused with passion, also carries a wealth of historical information. Since I was lucky enough to spend my summers canoeing, and traveling on long canoe trips, I can attest to how utterly bonded the traveler becomes with his craft. When you think of the simplicity of the vessel, the adaptability of the voyageur, the mastery of the skills required to endure the journey, it is a wonder. The canoe is much more than a means to an end; it is a thing of inestimable beauty. MacGregor writes of the transition from birchbark to cedar strip with chilling accuracy. It was gratifying to me to read that his research was thorough, and all credit due was given to David Thompson. As in all inventions, necessity brought us this development. As Thompson traveled west, he found birchbark to be scarce. Hence the cedar strip which while disputed seems to have been created out here in the northwest. Beyond the practical and natural, there is also something mystical about a journey by canoe. I am not making preposterous claims alone here; I have heard this voiced so many times and have read enough accounts to consider it a common experience. It begins as a child when you set off in high spirits and boundless enthusiasm only to hit a wall in about say, twenty minutes, where you suddenly feel that old, are we there yet, impatience. There is a bit of a breakdown that occurs. You can’t get out, you can’t get comfortable, your knees hurt, you are hungry, and you are thirsty, and we have to do this for the next eight hours? One has to learn patience, and one has to learn to be calm, and one has to pass the time in silly conversations or find a song where everyone knows the words, or surely you think you will run mad. After time, the canoe becomes quiet. Words are not needed now, and only the next bend, the next portage or thoughts of a warm fire and a good meal are all that seem to be on your mind. What happened to all the cares, the concerns, the endless thought patterns? They start to slip away, and the contemplation of whirlpools around the dip of your paddle take center stage. What used to transport me into the stratosphere of my highly excitable teen years was the knowledge that I had everything I needed. By the second week of canoeing, I did not want to return to civilization. I reveled in the simplicity of our world, and I could not get enough of exploration. I have been a happy wanderer, and I hope Canadians and Americans who love the outdoors will cherish this book. Pictured below is the author on a canoe trip in Ontario, Canada. This entry was posted in Narrative Non-Fiction, Uncategorized and tagged Algonquin Park, Canada, canoe, outdoor pursuits on October 9, 2015 by Elizabeth Smythe Brinton.